The new national government-organised China International Import Expo (CIIE), to be held at the National Exhibition and Convention Center in November, has necessitated the need for long-term renovation of halls at the fairground, requiring Yarn Expo Autumn 2018 to be held one month later, and concurrent with ITMA ASIA + CITME, from 15 – 17 October. The scale and importance of CIIE – an initiative launched personally by Chinese President Xi Jinping at a Belt & Road Forum in 2017, and hosted by the country’s Ministry of Commerce – has necessitated the renovation of three halls at the National Exhibition and Convention Center for a period of two months starting in early September. This unavailability of the full fairground has led to the decision to move Yarn Expo Autumn two weeks later to 15 – 17 October, still taking place at the National Exhibition and Convention Center. 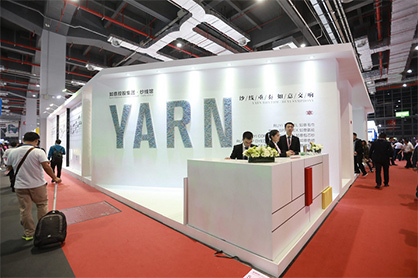 Therefore, Yarn Expo Autumn will not be held at the same time as Intertextile Shanghai Apparel Fabrics – Autumn Edition this year, but instead will take place concurrently with the biennial ITMA ASIA + CITME which runs for two extra days until 19 October. “This unavailability of the halls was unforeseen,” Ms Wendy Wen, Senior General Manager of Messe Frankfurt (HK) Ltd explained, “but upon notice from the fairground, we immediately assessed all possible alternatives for hosting the fair. While it is unfortunate that for this edition it will not be taking place concurrently with Intertextile Shanghai Apparel Fabrics, we are confident that the same strong business results can still be achieved alongside ITMA ASIA + CITME.